Richard Matty has an extensive 41 years experience in the securities industry. Richard serves as American Capital Partners Syndicate Manager and has formed relationships throughout his career with many of the most prestigious firms on Wall Street. Mr. Matty has spent his time at various firms throughout his career including Josephtal & Co., Swergold, Chefitz & Sinsbaugh, Mabon, Nugent & Co. and Ladenburg, Thalman & Co. At Josephtal & Co., Mr. Matty held the role as General Partner and Syndicate Manager. Mr. Matty played a key role in growing and expanding the firm adding 9 offices with over 300 Registered Representatives. After 13 successful years at Josepthal & Co., Mr. Matty was a founder and General Partner at Swergold, Chefitz & Sinsbaugh. With his industry knowledge and experience, Mr. Matty was able to build great relationships and was responsible for the creation of the syndicate department. With Mr. Matty’s experience as a Syndicate Manager and ability to build great relationships throughout his career, he was offered a job at Ladenburg, Thalman & Co. where his responsibilities included overseeing the syndicate department of the firm. 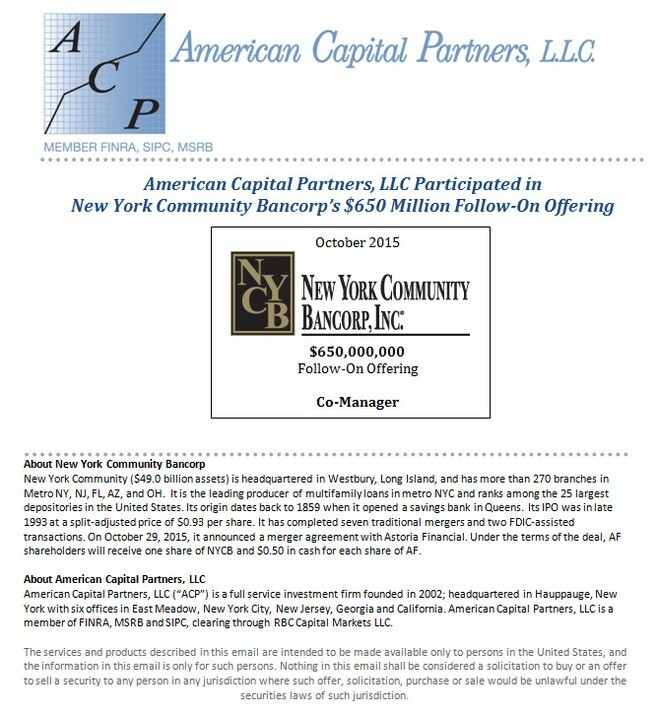 Mr. Matty Joined American Capital Partners, LLC in 2013. Mr. Matty holds a series 1, 24, 63 and PC licenses.